I was glad to receive a message from you. I guessed you were busy. We talk with Tatiana rather often. Her family life is OK, as far as I know. There are some problems at the committee, I think she will tell you by herself. Our autumn is almost over; very soon the winter will come. It is cold outside. I still have heat at home, but not at the library (it is extremely cold here). 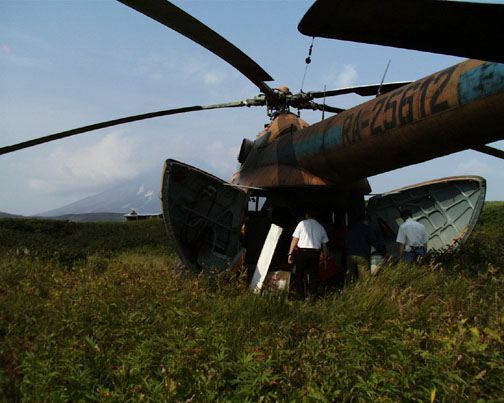 There is no fuel in Kamchatka. Starting with today, we'll have intermittent electricity outages for approximately two weeks according to a schedule, which is not always observed. I think it is only the beginning of our winter problems. Too bad, I have not enough time for working for myself at the library. It would be easier if I had a computer at home. I could work evenings after my daughters go to bed. Problems, problems... My ex-husband has come back from somewhere! Since his returning I am able to eat almost nothing, just strong tea without sugar and brown zwiebacks. If it lasts longer I will be much thinner then you, Maureen. We are still not paid (since April). The government promises to give us only our May salary (nobody knows when), and our June-September salaries will be "frozen", at best they would be paid in parts of 30% in addition to future salaries. People are gloomy; they are tired to be poor, without any hope to improve their lives. Me too. Sorry, my message is not amusing. I really have no reasons to be happy. I am to finish. Very soon electricity will be cut off, and I am to work with some more documents till my computer quits operating. I remember you and Charlie very often. You have become a part of my life, though we meet rather seldom now that you have left Russia. My best regards to Margaret and Mike, if you have an opportunity to get in touch with them. Good luck, and thank you for everything. We once again got back safely from another eventful season in Russia. This year we returned on one of Alaska Air Lines last flights and there is uncertainty as to whether they will fly there again for some time. We were also very concerned for everyone's well being as they bravely face a unthinkable winter with the possibility of no heat or power. For a city of 400,000 people, this seems to us a horrible prospect. We left behind all the things we could think that might be useful to our friends, before we got on the plane and also did as much work as possible to ensure that we would have all our political ducks lined up for future work there. Barring a total break down in that country, we will go back in the spring. We left our cubs with far better prospects for good times than the average Russian as they are assured lots of food, and skills to secure it, plus the "know how" to create for themselves a reasonably warm place for the winter. The summer with them was delightful as it provided us with a wonderful window into their lives as they developed their independence and took on the world as though they owned it. 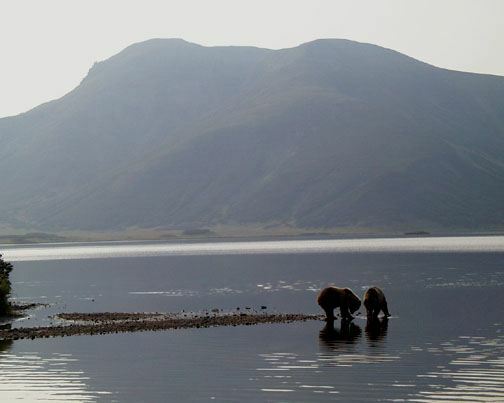 Except for the odd bear that is bigger than they are, they have possession of a large area of wilderness. We also gained much more valuable experience fine tuning our methods of dealing with encounters and living with bears in general. (details will be provided in our annual report forthcoming). Being with our cubs was a constant source of amazement for the uneducated bears, who happened onto the rather strange procession of people and cubs enjoying a morning walk together. It certainly seemed to provide a shortcut to gaining respect, which we find to be one of the key ingredients to being safe with these animals. The few people who have found their way to our cabin, like Rick Paddock, the Moscow correspondent for the Los Angeles Times, sighted the experience of walking with the cubs as the ultimate feeling of being a part of nature. He claimed it to be among the five best and interesting times he has had, writing columns for 20 years as a reporter for the LA paper. With the Russian economy coming apart just as he got back to Moscow, he has had to put this "nice story" on hold until everyone in the USA has their fill of the tough stuff and are ready for a positive hit, probably October or November, he thought in our last e-mail from him. There is a lot of interest in our work suddenly, due in part to our summer web page diary entries. With the photos that we were able to take and immediately include with our page, this made interesting browsing, as they to say. We had a wonderful, front page spread in our local paper, the Calgary Herald on (Canadian) Thanksgiving weekend and the documentary "Walking With Grizzlies" is being shown on the Discovery Channel October 18th and 25th in Canada and February 14th in the US. In the States, it is called "Walking With Giants,-- Grizzlies Of Siberia". Maureen will exhibit this summer's art at Masters Gallery in Calgary. We will kick off the exhibition with a slide show. She is also working hard on the preparation for a Canada wide exhibition opening at Calgary's new Muttart Gallery next fall, called "Though The Eyes of The Bear" which will be a fresh look from an artists perspective of the emotional side of a bears nature. 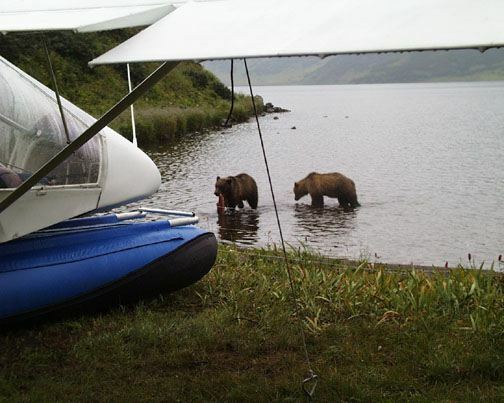 I am about to get started on my Kamchatka book for which I have a mountain of material to work with after three years of exposure to a multitude of bears plus the adventure that goes along with living and flying in that incredible part of the world. Chico, Biscuit and Rosie have developed into ambassadors to all Russian bears and we hope, bears everywhere. We have grown sensitive to their likes and dislikes in our everyday exposure to them in what has become their domain and we have taken on the responsibility of showing others how wonderful bears can be if treated in the ways they have shown us to be acceptable. We plan to maintain this relationship with them until we have the opportunity to experience their cubs or, at the risk of being cute, our grandchildren. This, we feel, would be the ultimate way to draw our study to a close as we feel our serene relationship with them is sustainable indefinitely and in fact, they have gained respect and learned to accommodate our fragility as they have gotten bigger. The trick in all this will be in surviving all that Russia keeps putting in our way as they struggle to come to terms with the difficult situation that they now find themselves in. My plane will get even more important as a tool to survive there as helicopters get even more prohibitive in cost and reliability. Of course flying won't get any easier for me as sometimes I feel I have pushed my luck about as far as I should go in that difficult environment. We are working on our various reports and will send out the annual report in November. We will also try to make updates to our web site as often as we can. The first board meeting of the foundation we established, the Cloud Line Environmental Foundation, was held and it looks very promising that it will be given a tax number soon for Canada. The board's plan is to put some effort towards establishing an endowment which among other things, will help Maureen and I continue our work with bears in years to come. We are very pleased at how things are working out thanks to all the support we get from all of you.